Seattle friends - I'm sharing a bill with Sweeter Than the Day on Sunday August 19th at The Royal Room. It's always a pleasure... hope to see you! Seattle friends - this will be a great Friday night! Darren Loucas has a new EP that he's introducing with a wonderful band. I'll play an opening set with Ivan Arteaga, Wayne Horvitz, Geoff Harper and Mike Gebhart. Barton Carroll will open the evening. It all starts at 8pm. Hope to see you! 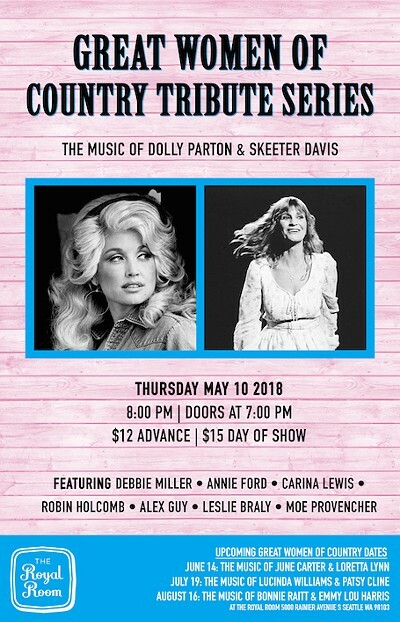 The Great Women of Country Tribute Series highlights the works of some of the most prolific and talented musicians the genre has to offer. Each performance – dates below – will bring together Seattle’s finest musicians to reimagine the works of two featured artists. I'll be playing a set with Tim Young, Wayne Horvitz, Geoff Harper and Andy Roth followed by the music of Sweeter Than the Day and Zony Mash at The Royal Room! Formed in 1999, Sweeter Than the Day began simply as the acoustic incarnation of Zony Mash. The band played a series of weekly shows at Seattle’s Baltic Room (curated by Reggie Watts), and quickly became Wayne Horvitz’s first piano-based ensemble in over 10 years, and one of Wayne’s longest-running groups, as well as one of his favorites. Despite the shared personnel, the ensemble is quite distinct from the electric Zony Mash and the repertoire is almost entirely different. The band has toured throughout the US, Canada and Europe. Sweeter Than the Day also presents double bills with Robin Holcomb, where it serves as Robin’s backup band. I’m very excited to be performing in the Earshot Jazz Festival on October 26 (7:30 pm) at The Chapel Performance Space with two of Vancouver's finest: JP Carter (trumpet) and Dylan van der Schyff (drums)! Opening: noted saxophonist and film-score composer Mikolaj Trzaska from Gdansk, Poland. This will be a lovely evening of music! With support from Polestar and the Polish Film Festival. I'll play a solo set before vocalist Nora Jane Messerich and guitarist Tristan Gianola, in town from New Orleans, join forces with an all-star Seattle band to pay homage to Annette Peacock's compositions, focusing specifically on music from her debut album "I'm The One". With Wayne Horvitz (synths), Willow Goodine (keys), Geoff Harper (bass) and Eric Eagle (drums). Robin Holcomb Band and Zony Mash: Night Two! Zony Mash made their debut in late 1995 as the unofficial house band at the OK Hotel in Seattle, where the band developed their sounds with months of weekly gigs. In Zony Mash you´ll hear a wide variety of influences, including sixties-style psychedelic rock, blues, funk, New Orleans and definitely some sounds that could only be described as being from outer space. Robin Holcomb Band and Zony Mash: Night One! Robin Holcomb Band: Robin Holcomb piano and vocals backed by the members of Zony Mash. I'll be performing along with Cruel Diagonals and Project Metamorphosis in a benefit for Planned Parenthood. Father Daughter Presents is an ongoing series dedicated to ambient music and visuals, held on the second Monday of every other month. Friday March 17th at ROULETTE in Brooklyn I will be joined by some of my favorite musicians: Guy Klucevsek, Sara Schoenbeck and Peggy Lee for a performance of songs, instrumental works and a concert version of my score for Yasujiro Ozu's masterpiece "That Night's Wife." Very excited to be playing two nights in the 32nd annual Seattle Improvised Music Festival: Thursday February 2 with Heather Bentley (viola/violin, Seattle) & Nicole Mitchell (flute, Chicago via SoCal) and Friday February 3 with Douglas Ewart (woodwinds,Minneapolis) & Catherine Lee (oboe, Portland)! The festival runs THREE nights. Many wonderful players participating this year! Doors open early each evening for a Merch Mart with performances at 8. I'll be playing a few in the Annette Peacock and Carla Bley episode of the wonderful series Piano Starts Here at the Royal Room along with pianists Randy Halberstadt, Nelda Swiggett, Dave Peck and Alex Guilbert. I'll be playing songs and instrumental duets on Sunday Oct 30 at the Black Dog Lowertown in St Paul with the wonderful cellist and composer Michelle Kinney. This will be our first performance together. Starts at 4pm. In celebration of the major overhaul of the Royal Room Steinway B and its tentative absence while it is undergoing repairs, The Royal Room presents “Piano Ends Here” on Monday, August 15th. Using a bizarre and very out of tune piano, the evening will be a preview of composer Wayne Horvitz's “21 Pianos” which will be created by many pianists in the state of Minnesota during the months of September-November. In this incarnation, local Seattle pianists - all past luminaries of the Piano Starts Here series - will each perform a piece of standard repertoire of their choosing, and an improvisation. The newly refurbished Steinway B will return in late August and in plenty of time for “Piano Starts Here: Alice Coltrane and Lil’ Hardin” on Wednesday, September 21st. The second of two nights at the Royal Room! 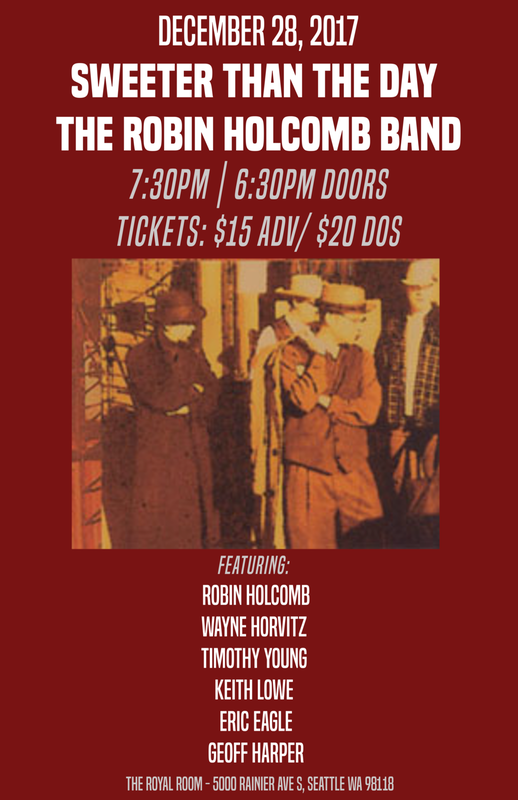 Zony Mash (Wayne Horvitz: organ/keyboards, Tim Young: guitar, Keith Lowe: bass + Andy Roth:drums) reunites as a quartet and will play an opening set each night with me as The Robin Holcomb Band followed by two long sets of Zony Mash! The first of two nights at the Royal Room! I'll be part of this homage to Bob Dylan and Blood on the Tracks in celebration of his 75th birthday. This is the late show at 9pm. The early show at 7pm features the songs of Highway 61: Revisited. I'll be part of this homage to Bob Dylan and Highway 61: Revisited in celebration of his 75th birthday. This is the early show at 7pm. The late show at 9pm features the songs of Blood on the Tracks. These shows are part of a 5 month series, celebrating Woody Guthrie and his journey through the NW and writing songs for the government made film, Columbia. A portion of the proceeds will benefit SMASH and our working documentary. As these songs appreciate the beauty of the NW, they also share the voice that Woody Guthrie contributed to American Folk Music. The month he spent in Washington state was perhaps the most prolific period of his career. It is quite timely to celebrate the bravery and patriotism that Woody exhibited in his life as we experience an upcoming Presidential election. We cannot think of a more fitting way to honor Woody than with this five-month tribute to him. Look for Greg Vandy's book released this month - "26 Songs in 30 Days"
I’ll be joining some of Seattle’s great pianists in a benefit performance in honor of the Royal Room’s Steinway B which needs some serious love after 5 years of hard labor. To guarantee a good seat, please make your dinner reservation here. I'm singing a few with Pigpen TONIGHT at the OK Hotel Family Reunion (Night 4). This festival has been wall-to-wall phenomenal music, so much vivid history and love in celebration of the iconic venue that closed its doors 15 years ago. Tonight's special guests include Michael Shrieve, Matt Cameron, Carla Torgerson, Tristan Gianola, Brad Mowen, Kate Olson, Sarah Manning, Beth Fleenor, Jessica Lurie and Amy Denio. Starts at 7pm. Tickets at the door. The Royal Room in Columbia City. Tickets ($15) available at the door. I’ll be playing a solo set in what will be a lovely evening of music featuring Jen Gilleran’s music and film project Nineteen Crimes and guitarist and songwriter Janet Feder who is currently on tour from Denver (accompanied by Jen Gilleran and Chris Icasiano). Robin Holcomb and Peggy Lee have collaborated since 2006 on a variety of projects composed by Robin Holcomb. Both distinctive composers and fierce improvisers, they have been featured performers at the Vancouver Jazz Festival, the PuSH Festival, the Royal Room and the Chapel Performance Space in Seattle. The duo is currently recording their multifaceted repertoire: compositions extended by improvisation, songs and settings of the poetry of Nazim Hikmet. Their music explores a wide territory – from contemporary classical to folk to free jazz and beyond. 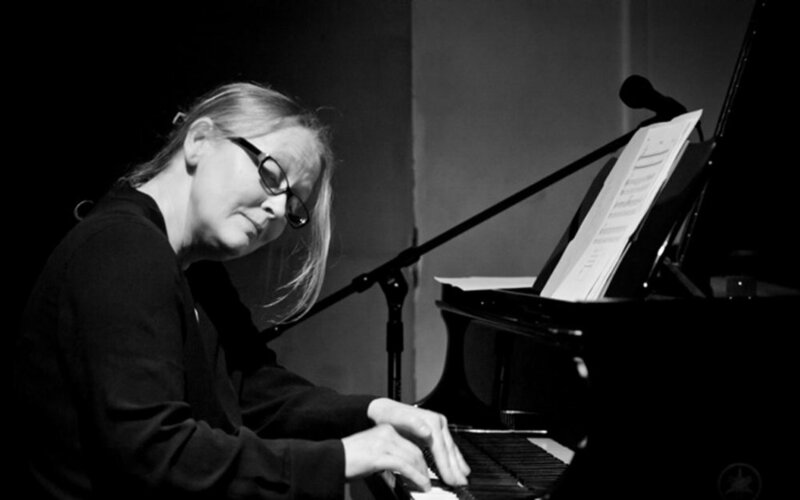 Pianist, composer, librettist, singer and songwriter Robin Holcomb has performed internationally as a solo artist and the leader of various ensembles at venues including Carnegie Hall, The Meltdown Festival, The United Nations, Teatro Manzoni, the Moers Music Festival, The Festival of Perth, The Hong Kong Arts Festival, Arts at St. Ann’s, the Guimarães, Verona, San Francisco, Vancouver and Earshot Jazz Festivals, Roulette, Royce Hall at UCLA and the Seattle Opera House.